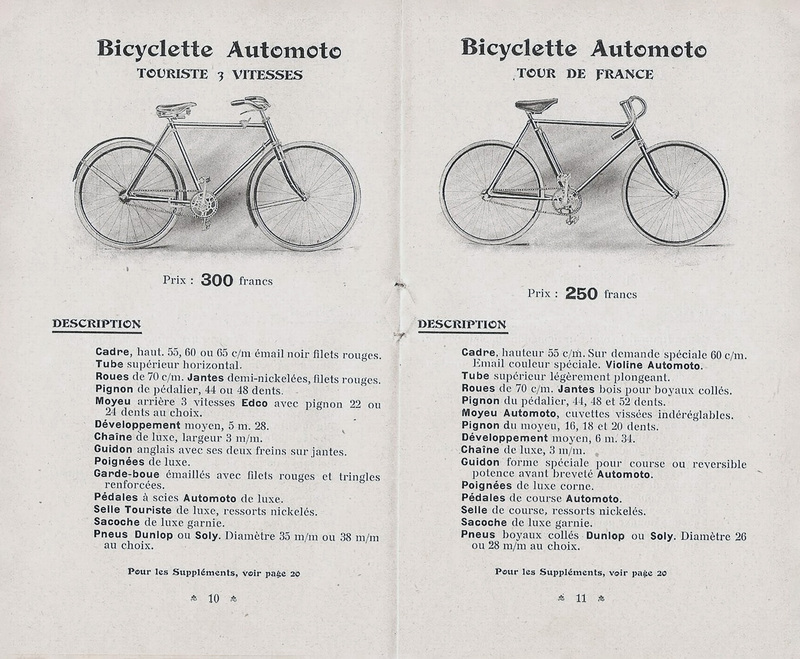 Cycles Automoto was a pioneering French manufacturer of bicycles and motorcycles founded at the turn of the 20th century. Well regarded for thoughtful design and meticulous construction, Automoto grew in popularity until merging with the Peugeot group in the early 1960s. 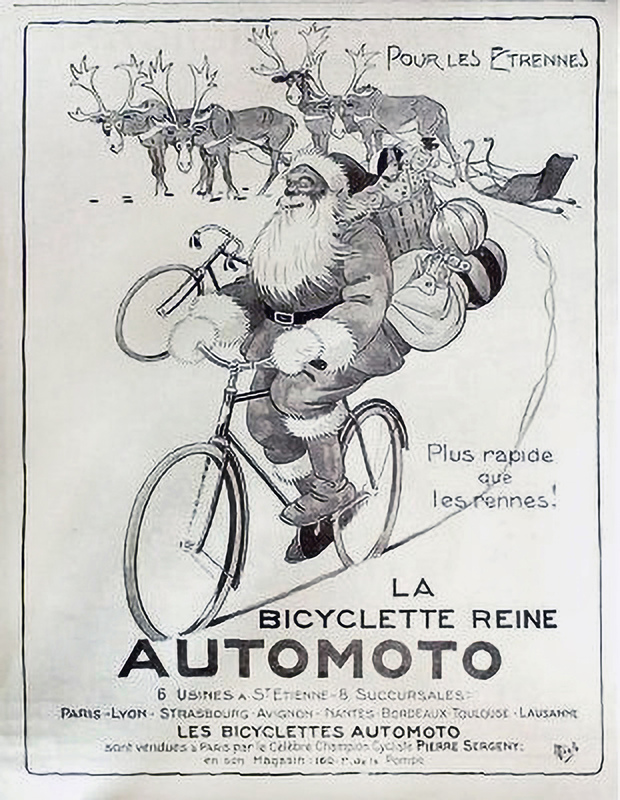 Nicer Automoto bicycles — of which there certainly are some — are relatively hard to find these days and costly when available for sale. It wasn’t always that way. 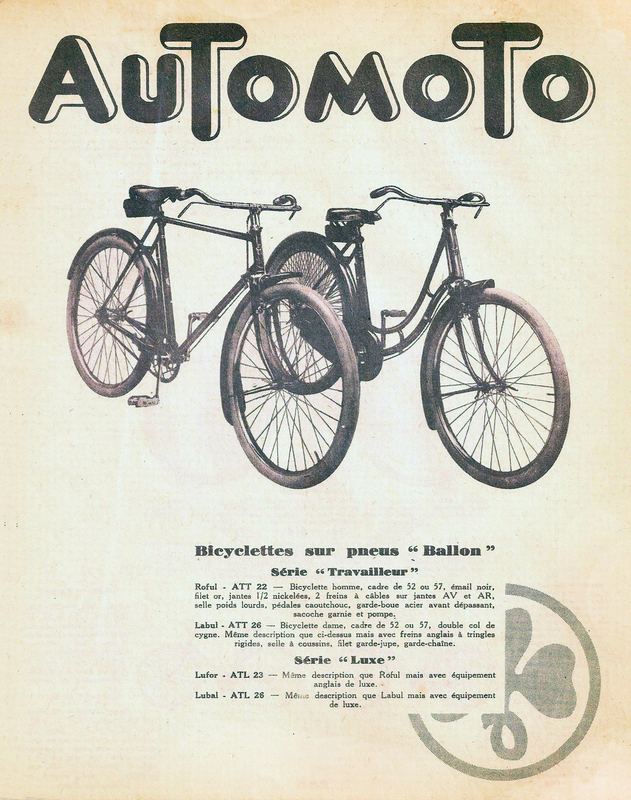 Part of Automoto’s popularity is attributable to the wide range of products historically available from the company, whose bicycle line alone grew to include a full twenty models. Another less immediate part of that popularity is traceable to the Automoto mystique, one whose allure — synonymous with a passion for quality — somehow continued growing through a pair of World Wars and burgeoning product availability in places like South America. Today, more than a half-century after the final Automoto left its Saint-Étienne birthplace, the timelessness of the company’s clover leaf logo and the transportation machinery that it produced in its compact fifty year existence are as meaningful as ever. Maybe it’s those striking posters that are taking over the Internet. One hundred years ago, things were very different. Taking a train from northerly Paris to southerly Saint-Étienne meant an uncomfortable and unreliable daylong journey through central France down into the Loire alpine range, southwest of Lyon. It also meant leaving arguably the world’s most culturally sophisticated city for among its most industrially minded. Unlike urban and chic Paris, St.-É’s, as locals sometimes call it, was ignominiously known for its mining operations and related industries. Inglorious as they were, these roots tapped deeply into abundant local iron and coal deposits, providing the essential elements necessary to seed and fuel what became known as the industrial revolution — or at least France’s contribution to it — and Automoto was squarely in the middle of things. 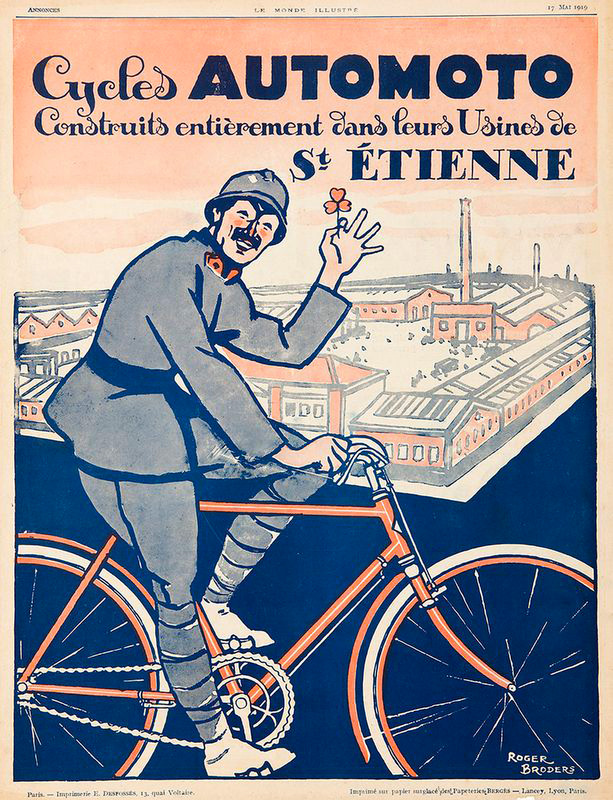 French cycling heritage — which is to say cycling heritage in general — originated in Saint-Étienne. 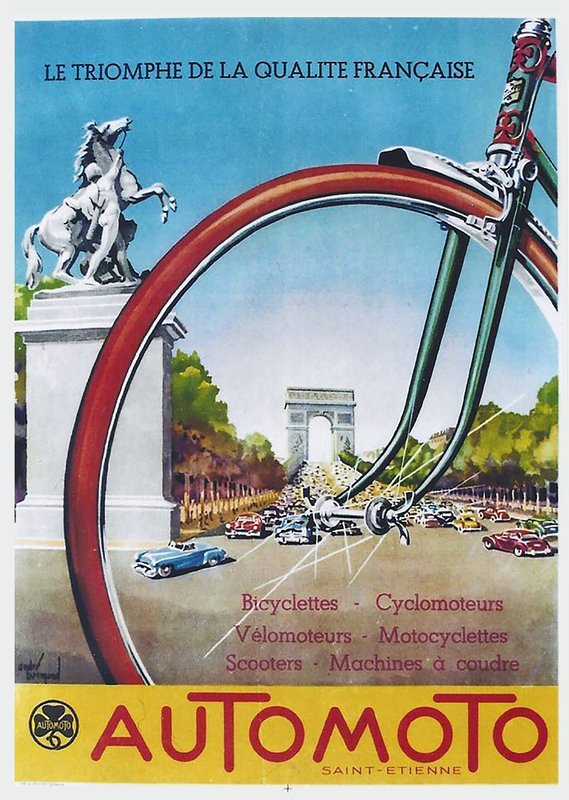 Popularly referred to as the “cycling capital of France” by unbiased experts like Sheldon Brown and Saint-Étienne itself, the city gave rise to notable cycling companies like Manufrance/Mavic, Motobécane and Vitus. Today its Museum of Art and Industry hosts the largest public collection of bicycles in France, from early forerunners to contemporary prototypes. What Coventry did for British advancements in cycling, Saint-Étienne mirrored for French advancements in cycling. 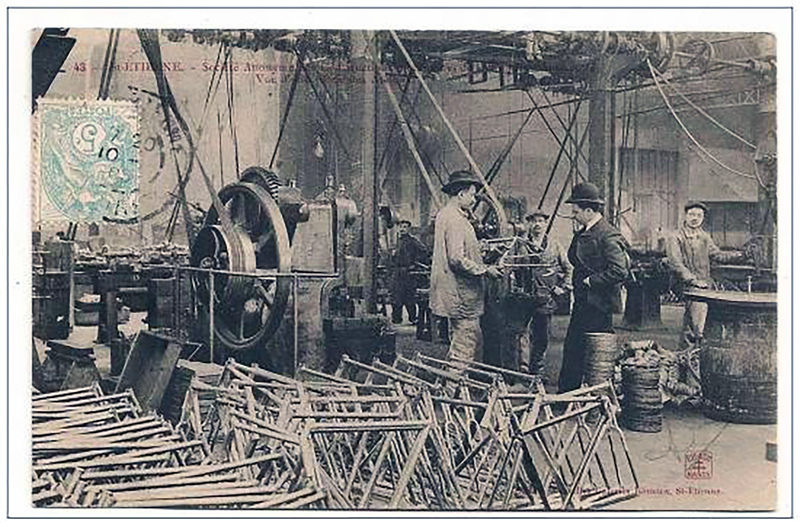 The summer of 1889 brought together four businessmen from Saint-Étienne — Montet Chavanet, Claudius Gros, Pierre Lapertot and Messieur Pichard — who formed a professional society named the “Société de Constructions Mécaniques de Cycles et Automobiles.” These men shared a passion for powered and unpowered mechanical transportation devices, at the time meaning bicycles, tricycles and quadricycles, and desired a common forum to exchange ideas around them. After nearly a decade of doing so, all the while refining various designs and coalescing as a team, Gros, Pichard and another man named Messieur Goudefer registered the Automoto marque in 1898. 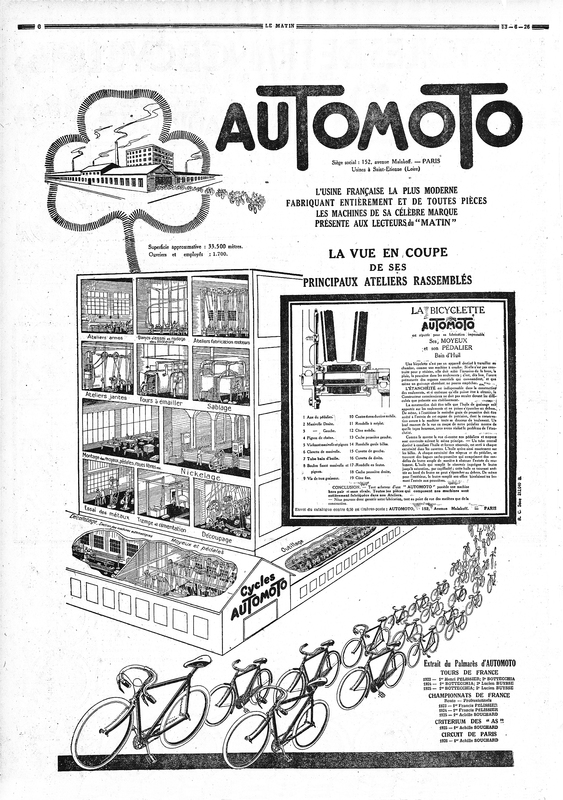 Another business was then registered in 1899 under the name, “Société de Construction Mécanique de cycles et automobiles Chavanet, Gros, Pichard et Cie.” Perhaps Chavanet felt left out, to the apparent detriment of Goudefer. The business was listed as a limited company in 1901 and renamed “Société Anonyme des Constructions Mécaniques de la Loire,” or CML for short. All involved must have breathed a great sigh of relief given the new, short acronym they could start referring to their company by. 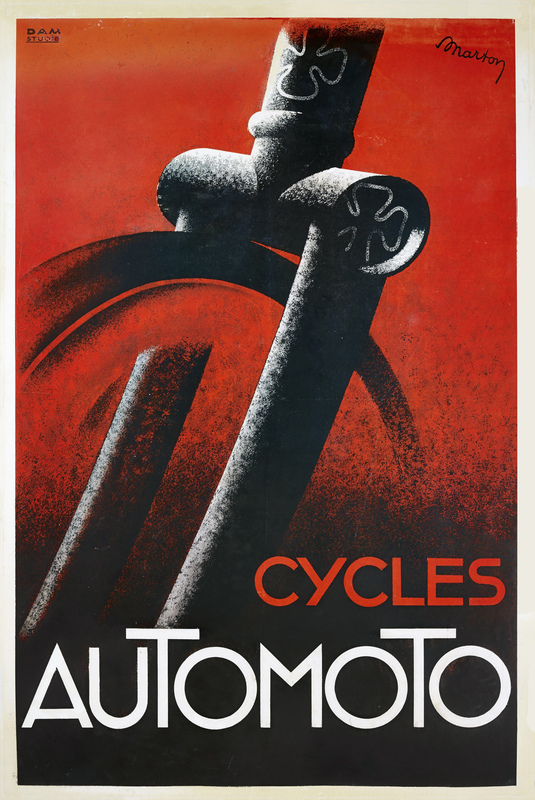 Not until another decade passed — and a forced liquidation brought about by strategic missteps related to autobody manufacture — did they assume their eventual name of Cycles Automoto in 1910. And so the three leaf clover was born, not so much with ambitions for growing into automobile manufacture as already having a healthy skepticism of all it entails. 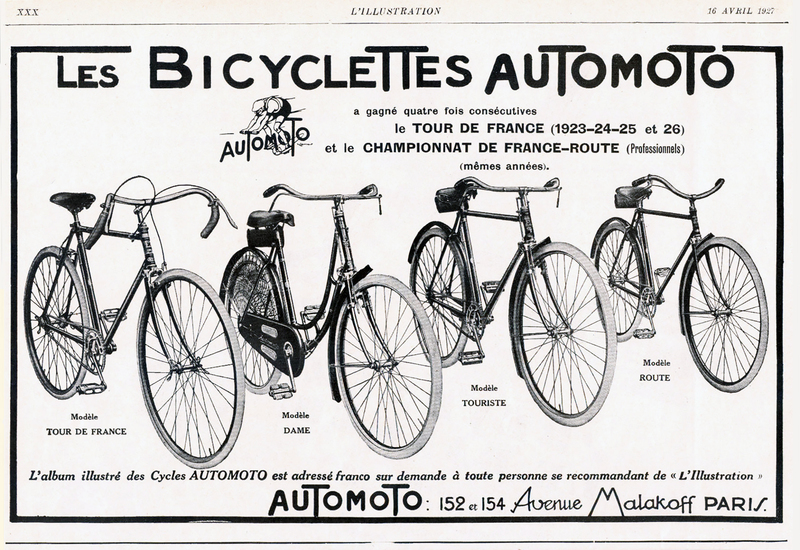 Highly respected among the day’s other great marques -– Alcyon, Clément, La Française, Gauloise, Hurtu, Peugeot -– Automoto bicycles came to be a preferred ride of the racing elite. During a particularly stormy Tour de France in 1913, it was said Lucien Mazan rode “more quickly than the stars” aboard his Automoto racing machine. The event was memorialized in a popular Automoto postcard featuring the affectionately-known “Petit-Breton” riding swifter than a trailing band of heavenly apparitions. Unable to secure that year’s yellow jersey, the legendary Argentinian cyclist will nonetheless always be remembered as the first to win the Tour de France two times, in 1907 and consecutively while defending in 1908. 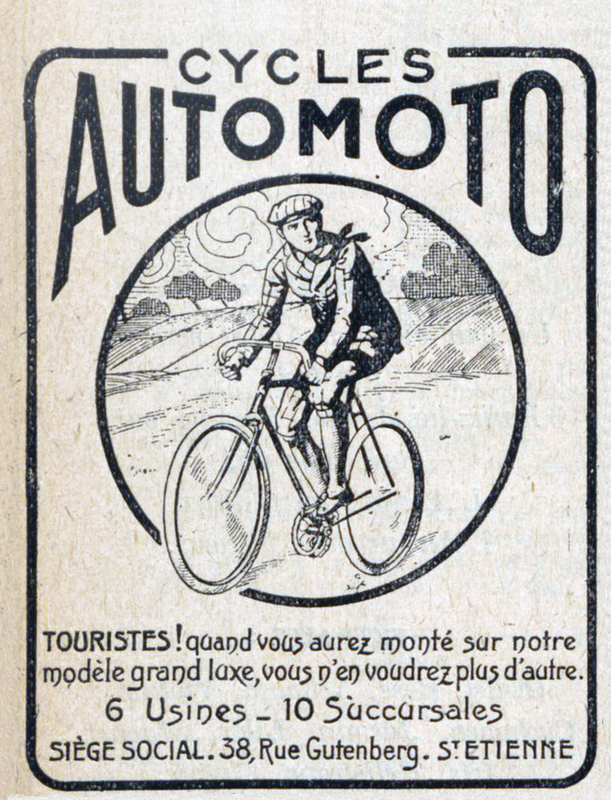 After World War One, Automoto followed a number of prewar bicycle manufacturers and joined the La Sportive consortium in 1919. 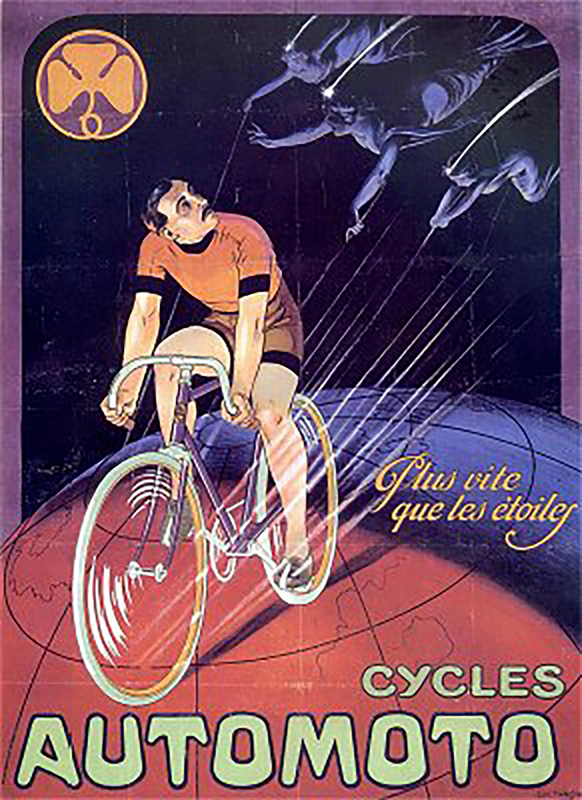 La Sportive was formed by various French cycling interests confounded by a deep desire to continue professional bicycle racing in the face of abhorred postwar realities. Member companies combined resources to equip some half of the peloton under the “La Sportive” name. Cycling author William Fotheringham further suggests the consortium gave constituents the added benefit of controlling riders’ salaries. 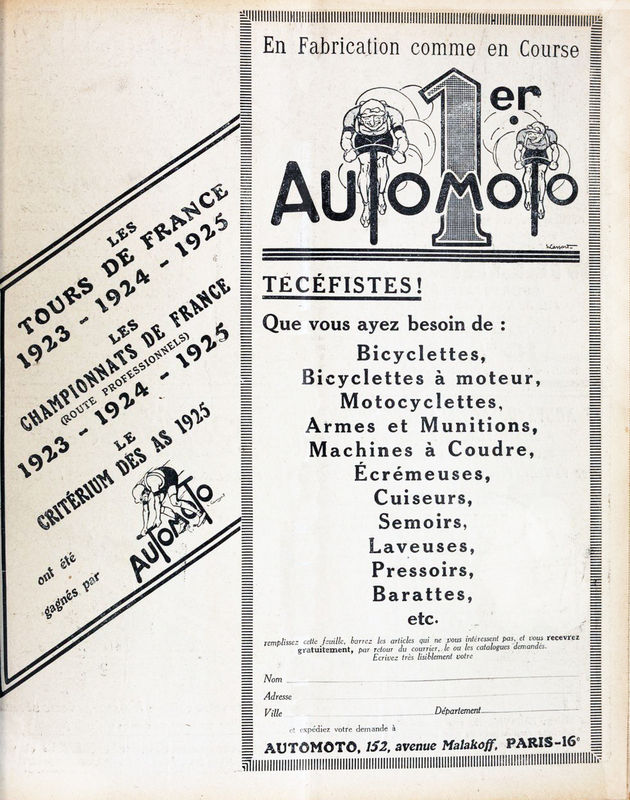 Member companies included: Alcyon, Armor, Automoto, Clément, La Française, Gladiator, Griffon, Hurtu, Labor, Liberator, Peugeot and Thomann. Three painful years of rebuilding later, several La Sportive members — led by industry titan Peugeot — started promoting their own brands again. 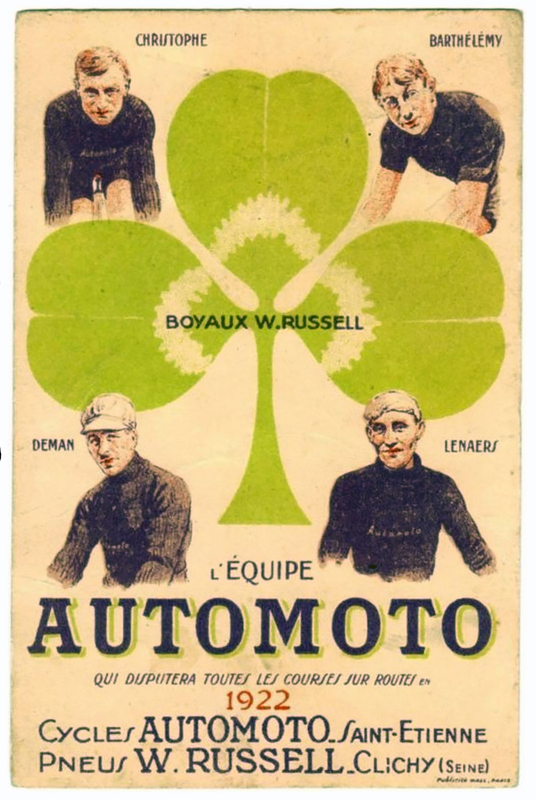 Prewar identities newly intact again, Automoto rose to its fullest prominence in the peloton. Its riders dominated professional cycling’s premier event, the Tour de France, from 1923-1926 with a series of convincing victories captained by riders with international appeal like Henri Pellisier (France), Ottavio Bottecchia (Italy) and Lucien Buysse (Belgium). Abruptly as the mid-nineteen twenties ended, so did the Automoto winning streak. The summer of 1927 watched a talented Alcyon squad led by several riders from Belgium and Luxembourg establish themselves as the new champion, a label not relinquished until 1930. A label never again coveted by once venerable Automoto, with the standout exception of Fritz Masanek’s unheralded eighteen wins on the Mexican professional cycling circuit in the early 1950s. Automoto’s commitment to racing and success on the podium led to decades of loyalty in the marketplace. Its many wins brought increased recognition among competition-conscious buyers and consistently growing sales for the company. Management reinforced the relationship between winning and selling with advertisements featuring competition models alongside others with broader appeal. It also responded to demand by expanding the Automoto catalog to include bicycles intended for a variety of applications only then being discovered by the riding public. 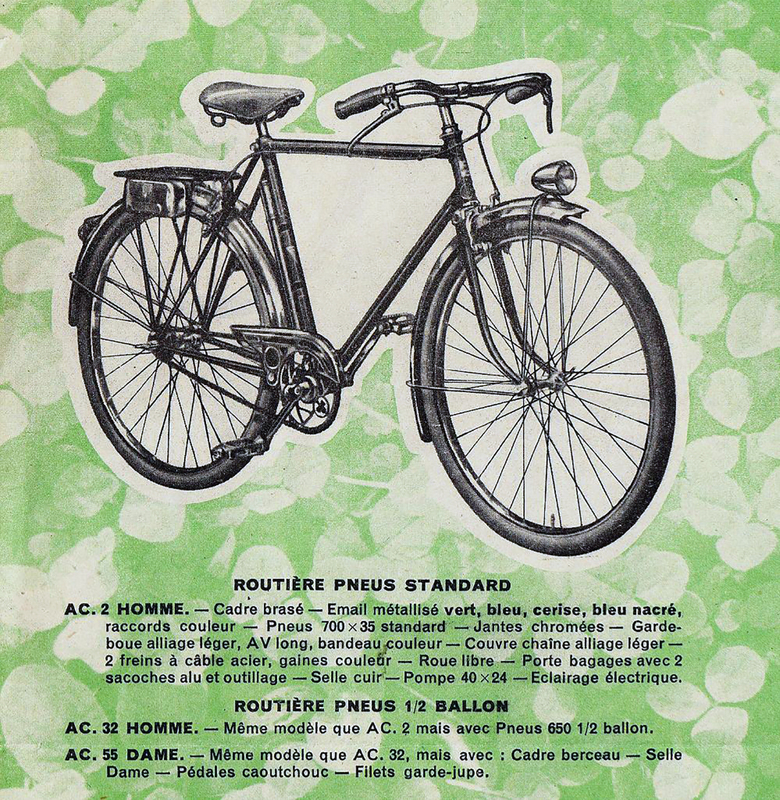 In as complete an annual Automoto catalog as any on record, 1952 product offerings to the French market included: “grande,” “ballon,” “demi-ballon,” “tourisme,” “randonneur,” “demi-course,” “course” and “porteur” class bicycles, with many available in both men’s and women’s models. 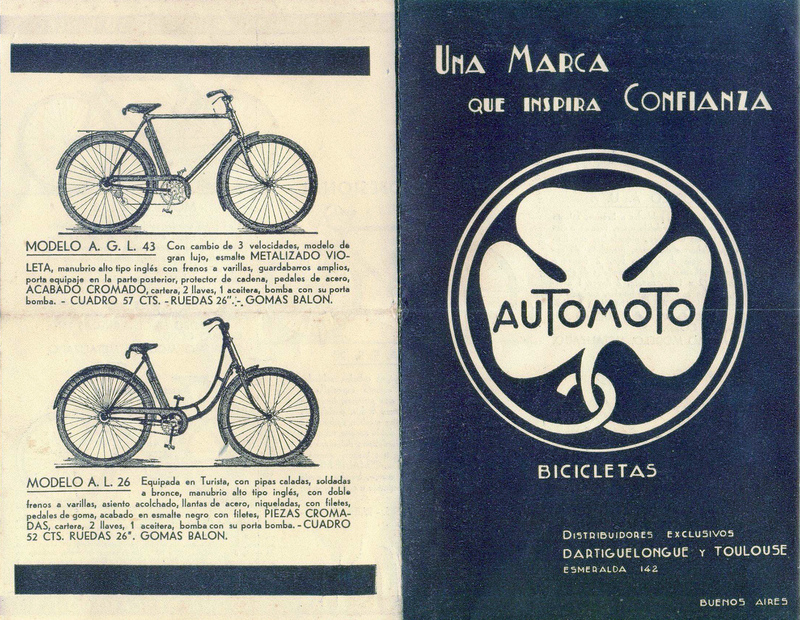 Automoto’s exposure to the U.S. bicycle market seems limited to the early 1950s. 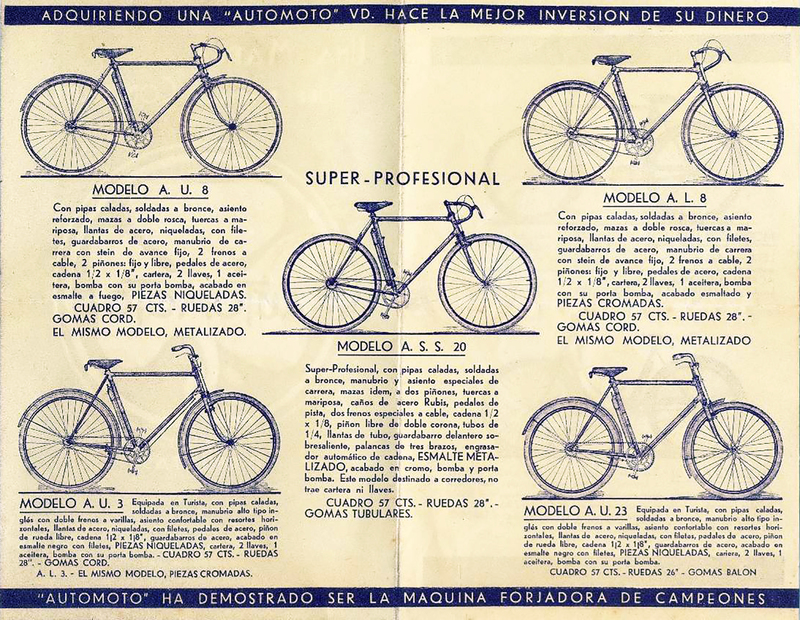 Propelled by Masanek’s victories in Mexico, the company began limited distribution of bicycles via Edward Lynch & Son, a mid-twentieth century importer of premium European cycling goods based in Compton, California. The second printing of the Edward Lynch & Son catalog in the early 1950s offered a roundly representative seven Automoto models. 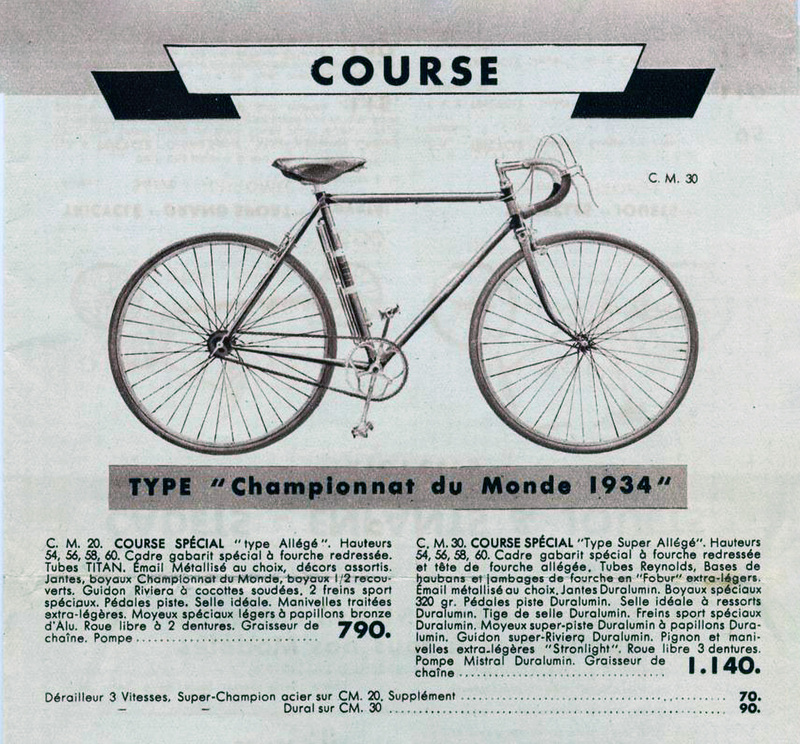 These included: the Deluxe Bicycle touring and racing models in eight speeds, a Fine Lightweight in three speeds, a Quality Lightweight touring and racing models in four speeds, and a Track Racing Model and Deluxe Touring Tandem. Years later, an invoice mailed in May 1957 indicates Automoto directly exported a Professional Light Racer Bicycle (Model ACSP 30) to an individual in Essex, Connecticut. Further details on the importation of Automoto cycles into the U.S. remain murky. An informative pair of reproduction Automoto catalogs are available for purchase at Velo Retro. The Cycles Automoto legacy ended abruptly in 1959 when Indénor — a subsidiary of Peugeot — purchased the Automoto brand rather unceremoniously and ceased production soon thereafter, further monopolizing previously overlapping lines of business. Only a decade earlier, when an Automoto advertisement boldly declared, “Le Triomphe De La Qualite Française,” few in sound conscience would have doubted the claim. Such is the nature of business. Half a century removed from the politics and persuasions of those days, the Automoto mystique — that of utmost quality and workmanship — endures. Even as fewer examples of Automoto bicycles exist, and those that remain command unprecedented premiums in the marketplace, the company’s commercial artwork is enjoying renewed appreciation among urbanites and vintage bicycle enthusiasts alike. Enlightening, in an era where the TGV hustles legions of passengers from Paris to Saint-Étienne in under three air-conditioned and air-cushioned hours many times daily. Lucky collectors of Automoto bicycles especially appreciate the sculpted clover lugwork found on fancier frames and trademark fork crowns. Mated to long rake fork blades, the stylized square crown with clover coin inserts was “purposely designed so as to withstand the most violent efforts, especially braking strain, and suppress all vibrations,” according to 1957 company literature, and it achieves these objectives remarkably well in a passive suspension package. Perhaps those early constructeurs back in Saint-Étienne were onto something. Their long hours spent drawing tubes by the fire, their dedication to understanding the geometry of champions, their jarred bones suffered from cobblestone field tests, none of it was for naught. The Automoto spirit continues living deep in many of us and forever will. I recently purchase an old bicycle and am hoping to locate some information on it. Listed below are the details. Can you offer any information you may have about it? I seem to be at a dead end collecting information. Any help would be appreciated. i have a late ’50s Automoto 3 speed which was my bike as a teenager. i would like to get it restored. can anyone provide information on where to find parts? I found what i suspect to be an early 60’s automoto 3 speed in very good condition for its age. Having alot of trouble finding out info on bike. It’s the first time even ebay couldnt gimme an idea of value, all they have is a poster of it. If you find any helpful sites let me know please. I have also just come across an AutoMoto 3 speed, no wheels or seat. Brake levers have plastic shrouds. My parents bought me a 20″ Automoto model in 1955. I still have the picture of me proudly holding it up in front of the Christmas tree. Other kids in the Bronx NYC got Shwinns or Huffy’s but none could catch me on a long uphill climbs that make up the Bronx. Light durable and speedy it made me admire things French. It was one of the reasons I studied French in High School. I cared for the bike well and never forgot the name. One day I just tried a search and was shocked to see the green frame and red tires I had raced on appear on your website. Thanks for the connection..
For Bob Sirkus or any other indivudual interested in restoring an Automoto bike. I found a bicyle restoration company in Vista California called Cycle Art. They have the orignal art required to restore an Automoto on file and professionally redid my Automoto. It looks great!. I have in Pordenone(Italy)an Automoto original from Ottavio Bottecchia winner of tour France 1924. Some antique collectors just have a passion for history. They like to be familiar with and to know why an individual object was used, how Ä±t had been used or who applied it. They are interested by the obvious ways which the world and technology possesses changed and grown. By collecting objects on the past they feel like they are partially connected to a period in which they for no reason lived, is long gone but somehow still survived.